Childhood Care Stirs Support for MGH Fund -- Mass General Giving. John Guertin scales the Bunker Hill Monument weekly in honor of his Mass General clinicians who restored his ability to walk as a child. The granite steps of Bunker Hill prove inspiring to a man who remains grateful to Mass General for restoring his ability to walk. 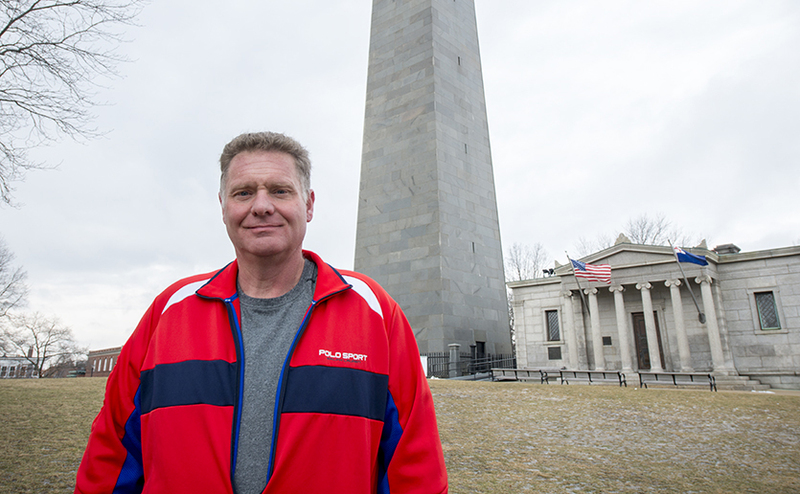 Every Sunday, John Guertin drives from his New Hampshire home to climb up and down the Bunker Hill Monument in Charlestown, Massachusetts. Every month, he donates $1,000 to the MGH Fund at Massachusetts General Hospital. He does both in honor of his Mass General doctors who restored his ability to walk when he was 7 years old. That childhood experience started a lifetime connection to the hospital and a desire to support its work. Mr. Guertin gives to the MGH Fund, which provides unrestricted support for the hospital’s most urgent and innovative projects. They include up-and-coming research, innovative technologies and state-of-the-art clinical centers. The MGH Fund also supports programs that give patients access to the latest clinical trials and most promising treatments. Now 50, Mr. Guertin suffered from Legg-Calvés-Perthes, a disease that strikes primarily boys from 4-8 years old. With it, the ball part of the hip joint temporarily doesn’t receive enough blood. One symptom is pain, as if “you park your car on your leg,” Mr. Guertin says. If it goes untreated, the bone can begin to die and break more easily. His condition went undiagnosed by multiple physicians, but Mr. Guertin’s parents persisted and eventually brought him to Michael Ehrlich, MD, at Mass General. The former chief of pediatric orthopedics quickly identified the problem in his left leg. Lacing up for his weekly walk up the Bunker Hill Monument, MGH Fund supporter John Guertin is grateful to be able to do ordinary physical activities. Treatment required surgery including cutting the top of his thigh bone (femur) and rotating it. He spent 10 weeks in a body cast. After physical therapy, Mr. Guertin says he was pain-free. Since then he has never had any physical limitations. The only effects, he says, have been a hip replacement in 2004, which is not an uncommon aftereffect of the disease, and being 5’10” rather than the expected 6’1.” Surgery was needed to slow down the growth in his unaffected leg. The whole experience framed his life. Mr. Guertin says that because of Mass General, “I’m able to walk.” And because of that, he was able to make a living. He joined his father in constructing and remodeling homes and buildings—more than 130 of them around Newburyport, where he grew up as a teenager. Having had a childhood disease, and particularly being in a body cast, influenced his attitude and gave him perspective, he says. Jobs like digging ditches and installing floors never bothered him. Being able to do any kind of work has been a kind of luxury, he says. His career has allowed him enough success to give back to Mass General. Starting in 2006, Mr. Guertin has donated $1,000 monthly to the MGH Fund. Remarkably, he how now given almost $100,000. Since he and his wife of almost 25 years, Lori, don’t have children, he says they intend to think about ways to continue to support Mass General. Riding to his childhood appointments lying in the back of his grandparents’ station wagon, he used to notice the Bunker Hill Monument and think that one day he would climb it. Mr. Guertin has remained with Mass General for all his medical care. His original doctors cured his Legg-Calvés-Perthes, but what stayed with him is that, even as a child, he felt cared for. That feeling has continued. “I’m at the right place,” he says. Riding to his childhood appointments lying in the back of his grandparents’ station wagon, he used to notice the Bunker Hill Monument and think that one day he would climb it. In 2006, he did it for the first time, and decided to make it a weekly practice. Sunday mornings are quiet. Mr. Guertin likes to admire the structure’s masonry work. And while the 294 steps up to the top of the monument don’t change, there are people from all around the world to talk to. As the clouds move, the view constantly shifts. Your gift today to the MGH Fund today will help us conduct groundbreaking biomedical research, improve patient care, extend community outreach and recruit and train world-class physicians. Please give generously to support the MGH Fund. The MGH Fund is an important source of funding that allows Mass General to pursue medical breakthroughs that help save lives.